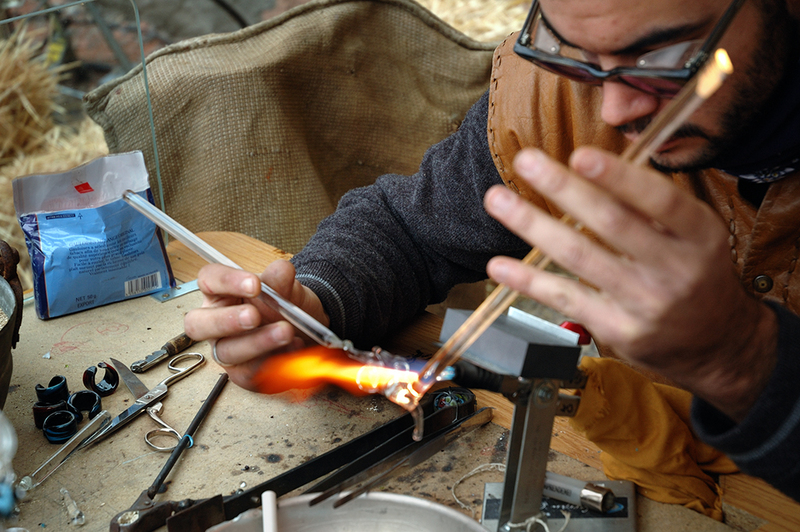 During a medieval craft trade fair that was organized in a town called Suria I caught this artisan working the glass to create miniatures by means of a torch. It is hard for me to understand how medieval this craft can be considering the safety glasses he is wearing and the lighter but if they created this fair which is celebrated every year by the way, they should know better. Other trades and crafts were previously posted here: the stonecutter, the basket weaver, the collier, the potter. This brings back a childhood memory for me! My family would visit Virginia City, Nevada, (an active "ghosttown" of the Old West) at least once each summer when we were kids - and my favorite thing to see was the miniature glassblower. Oh, how I wish my parents had bought just one trinket from him for me to have today! I understand that memory perfectly. I remember a couple of painted glass swans my mother had. Quite insignificant but truly magical for a child's mind.